NORTH BRANCH, MN.- CarTech's new 4x4 Suspension Handbook tells you everything you need to know to upgrade your suspension system for increased off-road prowess. The book explains the types of suspension available for all major manufacturers (and models), including Jeep, Toyota, Ford, GM, and Dodge, and goes into a great level of detail on each different model, including early and modern systems. Author and 4x4 suspension expert Trenton McGee covers front and rear solid axle, twin-traction beam, and independent suspension systems, as well as coil springs, leaf springs, shocks, and more. Learn how to design and build your own lift systems, or modify an off-the-shelf system for more lift. 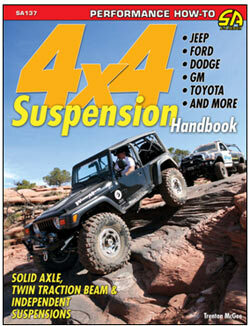 The book also includes a glossary of suspension terms and a comprehensive source guide.